Lucie, the manager at Outdoor Travel believes it is important to know our destinations and our local operators, boats and barges well. 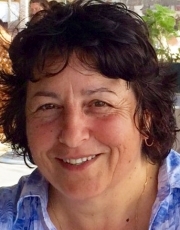 She has experienced many of the cruising holidays we offer including narrowboats, hotel barges, self-skippered motor cruisers and Bike & Barge or Bike & Boat cycling cruises in many countries. Why not discover a different side of Europe on one of her many historic canals or navigable rivers or perhaps island hopping by boat or even a sea-kayak? The waterways themselves are full of interest; colourful bird life, pretty little lock-keeper's cottages, sleepy villages, vibrant pubs, restaurants of renown, history and stunning scenery are among some of the things that await you if you decide to take the plunge... not literally we hope... and go boating in Europe with Australia's leading canal and river cruise experts. Originally used for transporting goods of all shapes and sizes, the length and breadth of many countries, navigable inland waterways provide a peaceful and unusual way of exploring France or Holland, Belgium, Germany, Italy, England, Scotland or Ireland. 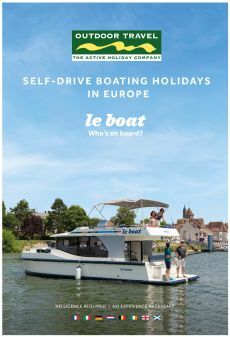 Self-skippered motor cruisers are hugely popular in France especially on the Canal du Midi or in Burgundy. Our boats on the Camargue in the south of France featured on the popular Australian TV travel show Getaway. A traditionally styled canal narrowboat is a very popular relaxing self-catering holiday idea in England, Scotland and Wales. We offer self-skippered or crewed narrowboats (sometimes called longboats) canal journeys from 4 to 10-days in many of the most popular destinations. These include weeklong, weekend or mid-week hire. 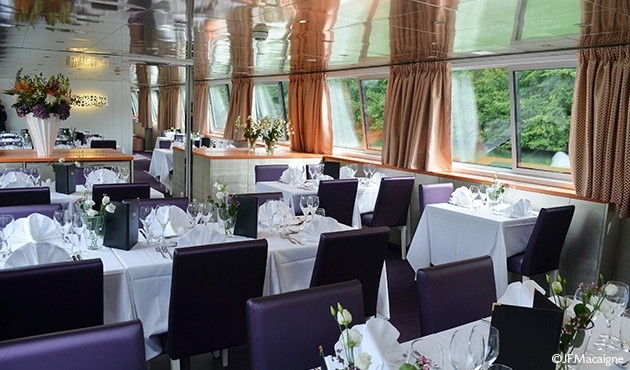 Hotel barge cruises combine two popular ways of exploring Europe, canal or river cruising with guided sightseeing excursions by coach or mini-bus. The hotel barge Anjodi hosted celebrity chef Rick Stein on his French Odyssey Series travelling along the Canal Du Midi from the Atlantic Ocean to the Mediterranean. Early bookings essential for this popular voyage - act quickly to secure places. Anjodi's partner barge in Rick Stein's project was L' Impressioniste which also cruised on the televised route at the Mediterranean end of the Midi from Agde to the oyster beds of the Thau Basin, the distillery of Noilly Prat and the Camargue with its wild horse, flamingos and famous fighting black bulls. This season L' Impressioniste has moved further north into the wine growing regions of Burgundy. 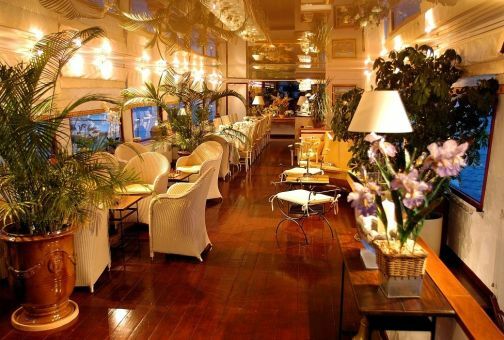 Other Hotel Barges are offered in Burgundy, Champagne, the Paris region, Provence, Bordeaux and Alsace. 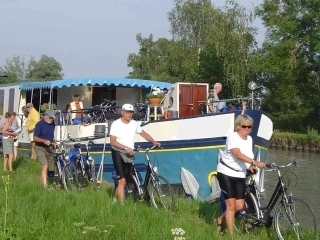 Bike & Barge or Bike & Boat cycling cruises combines two popular ways of exploring Europe (cycling and river or island cruising) allowing partners of different abilities and interests to holiday together (trips are just as interesting for non-cycling partners, leisure cyclist OR enthusiasts). You unpack once and come ‘home’ each night to a wonderful meal and a comfortable cabin with your own bathroom. These cruises are rapidly becoming the thing to do in Europe appealing to the more active traveller who is over 40. Click-on here to go to the European Bike & Barge Page. 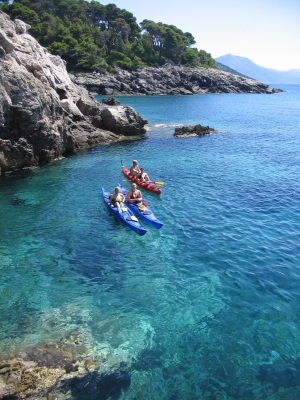 For the more adventurous looking for an active holiday why not explore the clear blue Adriatic Sea, Dubrovnik Kolocep, Sipan and the many Elaphite islands of Croatia by sea-kayak. With simple yet comfortable guest house / villa-style accommodation join our friendly guides on our regular small group holidays paddling past Dubrovnik’s old city walls to some of the many small unspoiled islands nearby. See details & brochures below - book early for all 2019 sailings as places are limited. Explore Burgundy or the Loire Nivernais region, taste the wines of Alsace or the exquisite cheeses of Brittany. 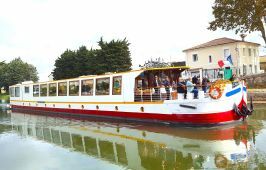 Cruise the ancient Canal du Midi, the Lot, along the Charente or discover the natural history of the Camargue in France. 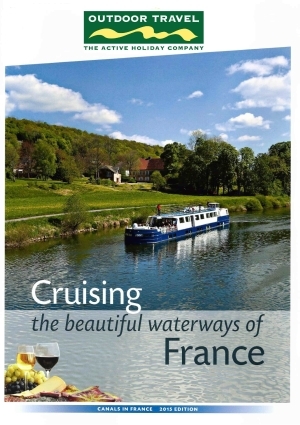 Le Boat (formerly Crown Blue Line) is the premier operator of self-skippered river or canal cruisers in Europe. They have an extensive fleet of over 1000 self-skippered boats accommodating from 2 - 12 passengers. All vessels are fully equipped with cabins, bathroom/toilets and well-equipped galleys. All boats are easy to handle - tuition given or skippers for hire if required - no experience or boat licence is usually necessary. Also available on the Royal River Thames in England, Caledonian Canal near Loch Ness in Scotland, the Venice Lagoon in Italy, the River Shannon in Ireland, Friesland in Holland or on the Mecklenburg Lakes in Germany. Optional bike hire (superior cross-country or standard bikes), BBQs or Wifi packs, one-way hire, vehicle parking or transfers are available in most areas. We offer a wide range of bases across Europe with one of the biggest and most modern fleets available. 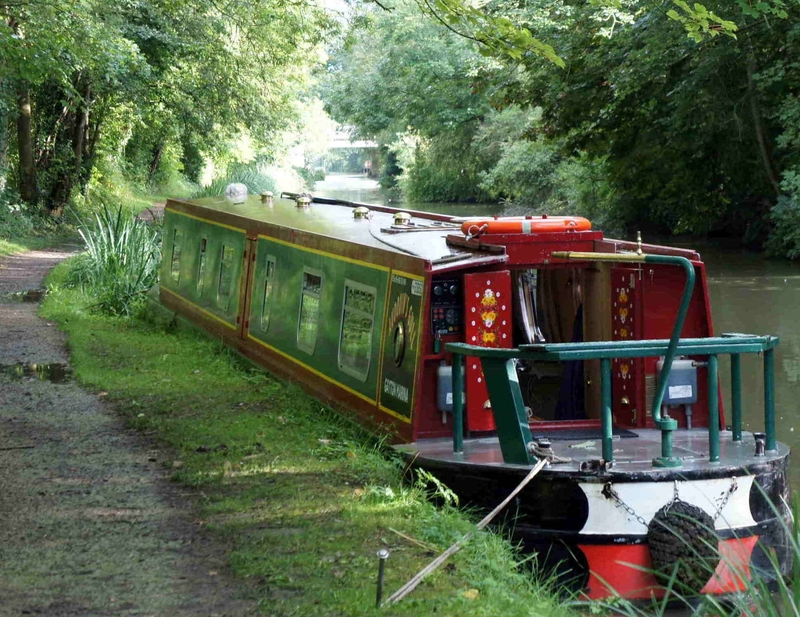 When most people think of canal boat holidays they picture in their mind the traditional British narrowboat or barge constructed during the industrial revolution in the 1700’s to carry cargo long the narrow, shallow canal networks built to link industrial centres. Nowadays these barges are very much a part of the English countryside scene as floating accommodation that moves at a snail’s pace through some of the most fascinating, historical and attractive regions where canals have always been important such as the Midlands and Birmingham, North Wales and the Llangollen region or northern England. 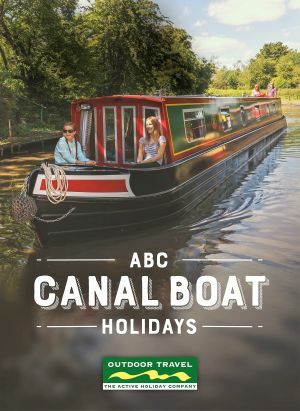 A wide variety of narrowboats accommodation from 2 to 12 passengers are available as self-skippered (self-catering) holiday options - see our ABC CANAL BOAT HOLIDAYS brochure for details. 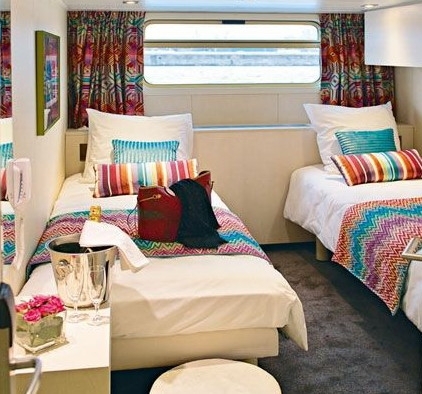 The layout of these narrowboats has been designed to provide maximum personal space and privacy. The interior, whilst narrow, is designed to offer double or twin beds, showers rooms with sink and toilet, a compact but well stocked kitchen with a cooker and refrigerator and there is a comfortable lounge dining area. 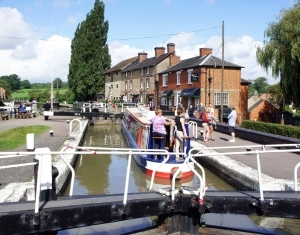 Barge are heated and have mains electric for charging small appliances. The narrowboats have all the necessary safety equipment and are collected full of fuel and water. 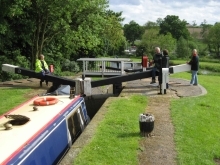 No licence or experience is required - narrowboats are very simple to handle - instruction is given when you on collect the barge and the base staff will run through all aspects of operating the boat and all the equipment onboard. Bases are positioned to give access to all the major canal systems and rings in the Midlands, North Wales, Scotland and southern England. Ideal for visiting the Falkirk Wheel, Birmingham (a city said to have more canals than Venice), Worcester, Chester, Great Haywood, Worcester, Shakespeare’s home of Stratford-upon-Avon, Warwick for popular Warwick Castle, Coventry with its glorious cathedral, Bath and the Llangollen Canal and Pontcysyllte Aqueduct. European Waterways offers over 30-years of experience in designing, building and operating hotel barge cruises in England, Scotland, Ireland, France, Italy and Germany. The fleet offers both suites and cabins for a maximum of usually just 6 to 12 pampered clients on a selection of 7-day / 6-night cruises. 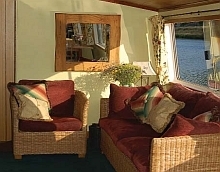 They offer the highest level of comfort with spacious saloons, dining areas and bars aboard their barges. Each is centrally heated, well-furnished and carpeted throughout. The twin, double or single suites or cabins are well appointed, each with its own bathroom or shower en-suite. A minibus accompanies the cruise to offer guided sightseeing, museum or gallery visits, wine tasting or transfers. The most recent and exciting edition to the fleet is Finesse, a luxurious, double-decker hotel barge that was launched for the River Saône and Canal du Centre in Southern Burgundy in May 2016. Departures are weekly - usually on a Sunday - ask for details. Starting with a bus transfer from central Paris to the beautiful Yonne region, cruise the River Yonne deep into the heart of Northern Burgundy past Chablis, Avalon and Vézelay to Clemency. 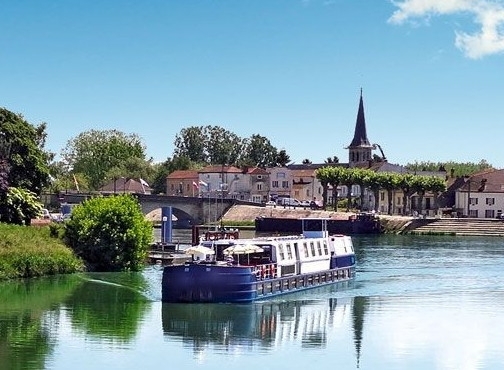 Interwoven with sections of the Nivernais man-made canal we cruise through 35 locks, past a succession of pretty stone-built villages along a waterway once used for floating timber and wine down to Paris. We follow path taken by the Romans and by pilgrims, past Charolais cows grazing in the lush green meadows alongside this enchanting waterway full of the character and charm of a past age. 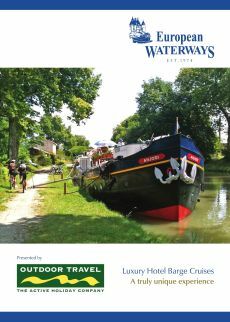 Our hotel barge cruise departs from Auxerre. 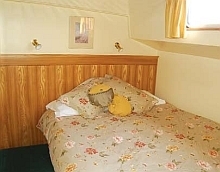 The comfortable and well equipped barge accommodates up to 12 guests in eight individually air-conditioned cabins (three have double beds which can be converted into twins and three have a twin-bedded layout and there are two single cabins). Each cabin has its own private bathroom. Meals on board the Luciole are treasured times: opportunities to share with friends, old and new, a summer luncheon or candlelit dinner. 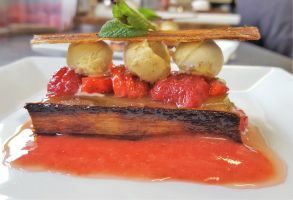 Our chef is encouraged to be innovative and imaginative, marrying French cuisine with a contemporary twist while using fresh local ingredients. Breakfast offers freshly baked croissants, pastries and bread. Lunch is a feast of salads and savoury dishes, followed by a selection of fresh fruit and cheeses. 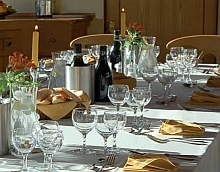 The four-course evening meal is the gastronomic highlight of each day, to be concluded, on the starlit nights for which Burgundy is noted, with coffee and liqueurs on deck. Daily-guided excursions are offered by air-conditioned bus - to medieval towns, châteaux and the glorious vineyards of Chablis - blending culture and shopping opportunities along the way! Beside the canal the old tow-paths, free of passing traffic, are perfect for a stroll beside the barge as she makes her way between the locks. Bicycles are also provided for use of passengers and are popular early in the morning or before dinner. We take you on a wine tour of the country, choosing wines to complement our menus - all are recommended by wine expert Marc Ragaine, a world renowned independent wine merchant. We serve French wines from many different grape varieties each with its own specific character, reflecting the 'terroir' and the great diversity of the vineyards of France. The 'open bar' is freely available at all times. The sun deck, with seating, tables and umbrellas, offers the perfect place to enjoy the scenery pass by. From the air-conditioned saloon area large picture windows allow uninterrupted views of rural Burgundy. Plenty of time to be active or just to relax and unwind as your day and your mood takes you. 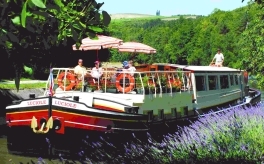 We offer six barges designed with just 11 or 12 double / twin cabins for up to 24 passengers which allows access to tranquil cruising on the smaller waterways of France visiting many small towns, villages, charming French châteaux or vineyards. The tour bus then gives access to the larger sightseeing destinations. These custom designed hotel barges have been equipped with comfort in mind for unforgettable holidays. With a client/crew ratio of 4 to 1, passengers are pampered by a trained professional crew at your disposal, so you can relax on board and have a truly wonderful time. Cruises offer a high standard of meals prepared by our on-board chef, serving traditional and regional cuisine with a selection of local wines and cheeses. Breakfast is an impressive self-serve continental buffet. 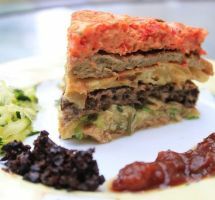 Lunch and dinner are usually a 3-course sit down meal with a fixed menu of local specialities prepared daily from fresh ingredients and accompanied with complimentary wines or soft drinks, beer, tea and coffee. There are speciality wines and Champagne available for purchase from the bar. Sightseeing excursions are available on most days, including a guided city-walk or bus tours of regional highlights, or you can relax, take a stroll or bike ride along the towpaths and a host of other activities. Cruises usually include: All meals from dinner the first day to breakfast on day 7, drinks (wine, beer, fruit juices and coffee during lunch and dinner on the boat), drinks from the bar (except champagne or listed wines), double-occupancy cabin with ensuite shower/toilet, on-board multi-lingual host/hostess, welcome cocktail, gala dinner, port fees, transfers by bus to/from the barge, excursions as shown, Wifi, use of bikes. Not Included: Drinks on excursions or transfers, optional excursions (offered during cruises - must be reserved and paid for on board), cancellation and baggage insurance, personal expenses, crew gratuities. Everything in our cruises has been designed to help you feel at home. You will rest and relax while the boat meanders through the tranquil waterways of southern France. Once on board, you will be introduced to the crew with a welcome drink. After a brief presentation you will be guided through the boat by the captain. Then a brilliant dinner specially prepared by our Chef is served on board. Next morning you are ready for your first day of cruising. All meals are served on board - prepared from selected local ingredients - by our resident Chef. Breakfast and lunch usually consist of a hot or cold buffet. Dinner is a more traditional gourmet meal served at table. You will discover a wide variety of local specialities including fresh cheeses, local wines, red, white, rosé, Champagne and other sparkling wines. Between 2 to 6 hours a day are dedicated to navigation. One or two excursions a day are organised specially for you. We must stress on that point: the excursions we offer have been designed exclusively for our passengers, sometimes to places where perhaps they did not usually welcome tourists. Of course you will also visit some famous monuments and places of interest, but usually outside of the busy periods. 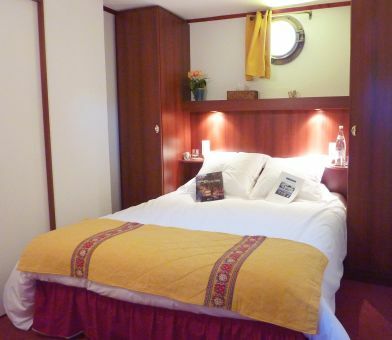 On board the hotel barge there is a great selection of books and games. You will also appreciate the paintings from local artists exhibited in the main lounge. Cycling is an invigorating way to stimulate your appetite and there are opportunities to explore our ports of call in the evening. All cabins and corridors are adorned with beautiful photos of Provence from Gérard Sioen (a famous photographer in this region). Bathrooms have been totally refurbished with new furniture, new showers, new tiling (shower and floor) and new brighter neon lights. We know you will enjoy the changes! “Le Phénicien - River Rhone in France - We have been back from overseas now for four weeks but are still catching up on things which needed doing here. However before the memory faded too much we did want to let you know how much we enjoyed our 'Le Phénicien' trip. The crew were wonderful and the owners were obviously very particular and caring about the whole exercise. Bike & Barge cruises combines two popular ways of exploring Europe (cycling and river or island cruising), it allows partners of different abilities and interests to holiday together (trips are just as interesting for non-cycling partners, leisure cyclist OR enthusiasts), you unpack once and come ‘home’ each night to a wonderful meal and a comfortable cabin with your own bathroom. These cruises are rapidly becoming the thing to do in Europe appealing to the more active traveller who is over 40. These fully inclusive cruises offer the opportunity to explore beautiful countryside and historic cities sampling traditional Belgian or German beers, regional wines and fresh cheeses, hams or local produce in the company of like-minded cyclists. These holidays are conducted in English but passengers often include a mix of different nationalities – with English, German, French or Dutch as the main languages - adding to the cultural enjoyment of the experience. Well-maintained multi-geared bikes are provided (passengers can bring their own if they prefer) with panniers to carry your picnic lunch and camera. The cycling is fascinating and varied with free time to explore each day’s destination. Tours are usually guided or self-guided over 8-days / 7-nights with some two-week tours on the popular route from Paris to Bruges through the Somme in Northern France. Explore the clear blue Adriatic Sea, Dubrovnik, Kolocep, Sipan and the many beautiful Elaphite islands of Croatia by sea-kayak. With simple yet comfortable guest house / villa-style accommodation join our friendly guides on these regular small group holidays paddling past Dubrovnik’s old city walls to some of the many small unspoiled islands nearby. Tours depart every Sunday from May to September from Dubrovnik. The pace is gentle, with time to relax, explore or swim, with tuition given if required. Guided holidays include twin share accommodation in a private guest house, breakfasts, some lunches and dinners in local restaurant, guided sea kayaking, fully-equipped sea-kayaks (paddles, life jackets, spray deck), ferry tickets and local transfers. Morning: Our base is a guest house where we stay overnight and meet each morning for breakfast. The main activity is paddling and we stop en route at hidden beaches and caves for swimming, snorkelling and exploring. Lunch: We take a break from kayaking at typical local taverns and restaurants where the food is delicious and the prices reasonable. On the islands there are also shops to buy sandwiches or snacks. Afternoon: After lunch we usually take a siesta as it is the hottest part of the day where we can swim, snorkel, explore the island or simply relax in the shade and enjoy a coffee. After our siesta we continue our kayaking expedition. Late afternoon: We return to the guest house usually in plenty of time to shower and relax before dinner. Evening: We usually dine in a traditional local restaurant. 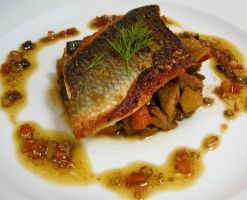 Three dinners are included in cost for the full week program and the food is usually typically Mediterranean with meat or seafood specialities, fresh vegetables seasoned with olive oil and salad. Vegetarian dishes are usually also available. Detailed itineraries and trip notes are available for all these holidays and destinations. The OUTDOOR TRAVEL staff personally visit many of our boats and have experienced many of the holidays we offer. They can explain the differences between holiday types and boats and help you choose the cruise that will best suit your plans.